I accomplished a lot this weekend despite a teething toddler who spent a lot of time melting down over the weekend!!! Poor baby girl! Between meltdowns I go a fair amount accomplished. I will post an update on the church pew progress later. After looking at all of the material I purchased for the cushion for the outdoor pew I realized I bought WAAAAY too much material. I'm not sure what I was thinking.... I knew the pew was approximately 8.5 feet long. Converted to metres that's about 3 metres... however I picked up 6 metres of fabric. Who knows what conversion I was using at the time!!!! So after measuring it out I decided the fabric would look GREAT on the cushions of my dining room chairs! Now we have 7 chairs, 4 came with our table and the other 3 we found at an antique store for $25 each and they are ALMOST identical. However the 4 original chairs have a cream vinyl on them and the 3 newer chairs have a flowery material on them. 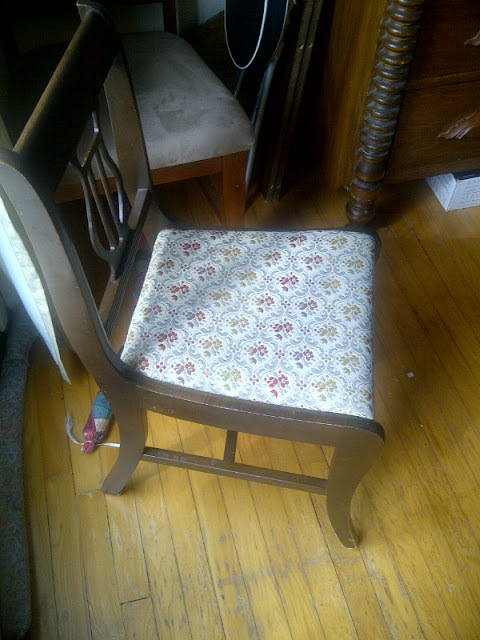 I figure since I have the fabric and love it lets match up my chairs. Here is the one chair I took a stab at on the weekend. Since I wasn't entirely sure what I was doing I figured I would test it out on one chair first before taking all of my chairs apart. First I unscrewed the seat and pulled the old fabric off of seat. The cushion was in great shape, the hardest part about this was taking the old fabric off... it was secured in place with I kid you not 100 plus staples!!!!! Next time I'm using a staple remover and not my fingers!!! 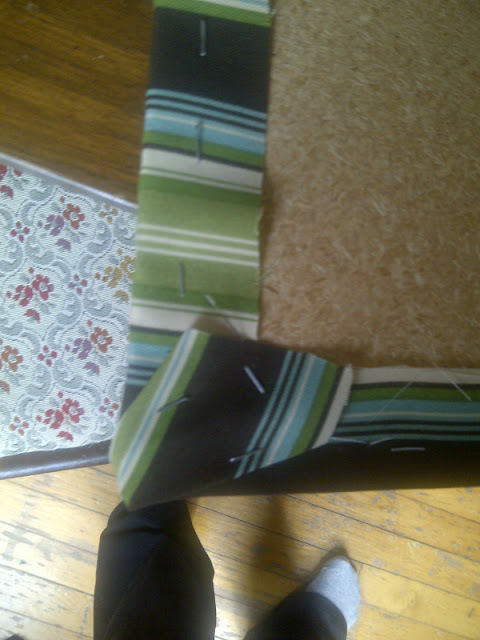 Next I used the old fabric as a template to cut out the new fabric. 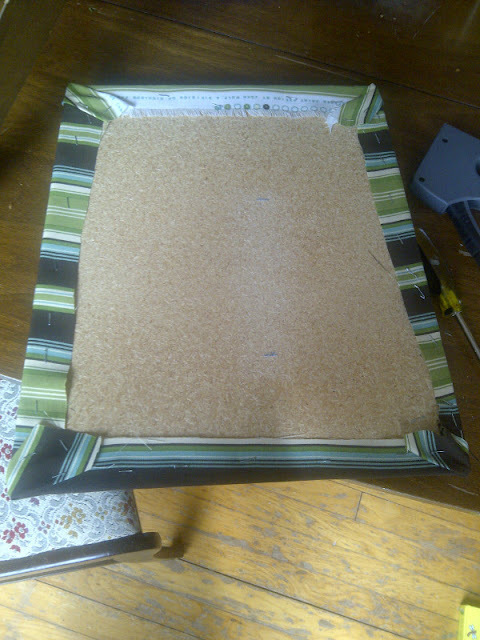 Wrapped it around and using a friends staple gun (Thanks H) in a matter of 5 minutes I had accomplished this. Without using 100 plus staples!!! The corners were a little tricky but I used the same technique the old material had been secured with and it worked nicely! 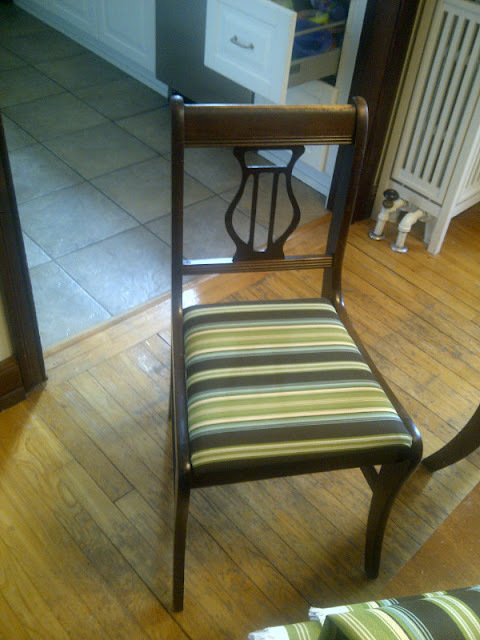 Then I put the seat back onto the chair and realized 'oh crap the stripes are slightly crooked'.... Oh well. This was the first chair so with the next one I will make sure to put it on straight. But I love the end result!!! Now I just have 6 more chairs to do! What to do on a beautiful Sunday morning? ?